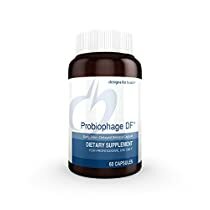 Probiophage DF is a specialized bacteriophage formulation combining four types of phages (as the proprietary bacteriophage blend PrePhage) along with seven strains of probiotics. This product is designed to support the proliferation of beneficial bacteria throughout the small and large intestines in order to promote healthy GI and immune function. This formulation contains no dairy and is in a delayed release capsule to increase intact delivery to the small intestine by protecting these organisms from stomach acid. Contains no GMO ingredients.